Open courses, also known as scheduled courses or public courses, are courses that are run at set locations on specified dates. Many training providers offer a range of open courses in a variety of areas based on their expertise and many often result in certification and qualifications. Training courses that are scheduled in advance to run at a specific location on specific dates and times are known as public, scheduled or open courses. These courses are popular among professionals seeking to develop their skills in a specific area to improve employability and career development opportunities. Training providers offer a wide variety of open courses on many topics of interest. From soft skills to advanced technical skills, there are open courses to meet every need. These courses can help you and your staff achieve their full potential and improve performance. Masterclasses are available to develop executives and high level personnel from within the management structure of a company. How are open courses structured? Open courses are often the most effective way of acquiring certification or qualification across all industries. They vary in length depending on the course provider or nature of the topic, ranging from a few hours to up to several years. Generally, however, open courses run over a day or two. Formats for open courses vary just as much as the topics covered. Commonly, professional development open courses are held during the week. However, evening courses, blended learning options and weekend courses provide added flexibility for busy professionals to work around their schedules. Open courses are available to anyone who meets the specific prerequisites of that particular course, though they are particularly advantageous for those wanting to learn on their own or for smaller groups of people from your organisation. These courses are usually carried out with employees from many different companies, offering the opportunity to exchange thoughts and ideas with other participants from a wide range of backgrounds. This is particularly valuable if you are the only person from your own organisation and need further inspiration in your work. Open courses encourage out-of-the-box thinking when there are delegates attending from several different industries. More often that not, open courses mix theoretical expositions with hands-on exercises that allow participants to try the tasks within a group and also get explanations from the course leaders. Open courses are generally held in dedicated training centres, especially when a training institution has its own training facility. These are fully equipped with all the materials, presentation equipment and often with refreshment provisions, making the training experience more straightforward for delegates. In other cases, training institutions may hire a location for their open courses, often hotels or conference centres. 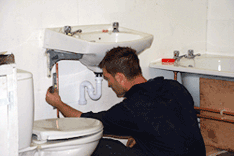 "I am now City & Guilds and NVQ qualified - already recommended by clients." Get hands-on training assistance and City & Guilds accredited diplomas from Goldtrowel, UK’s leading provider of Plastering Courses!